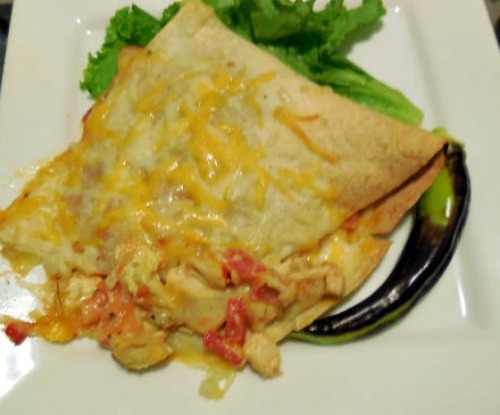 This homemade chicken quesadilla recipe features zesty chicken and cooked red peppers peppers mixed with cheese and stuffed in a tortilla. The recipe is easy to do and great for a busy week night when time is at a premium. The recipe comes together in a flash. You can even use rotisserie chicken if you wish to save even more time. Add a tossed salad and you will have a spicy Mexican treat that your whole family will enjoy. 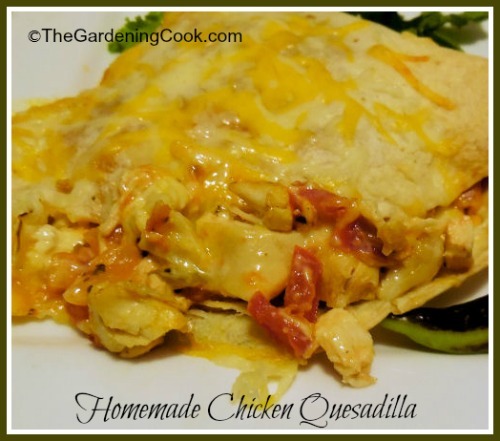 Sweet peppers, salsa and cheese are mixed with chicken and spices to make these homemade chicken quesadillas. Heat the olive oil in a frying pan over medium-high warmth. Cook chicken breast pieces and red peppers until the chicken is cooked and the peppers are slightly soft. Add the cilantro and cumin and mix well until cooked through. Lay out the tortillas and spread 1/4 of the mixture on each. Add one half of the cheese and the chilies, leaving about 1/2 inch free at the edge of the tortilla. Add some salsa on top of the chicken mixture. Fold the tortilla and place in a baking dish. Heat in a preheated 350 ºF oven for about 10 minutes. Add the remaining cheese and continue cooking until the cheese melts, about another 5 minutes. Serve with salsa and a tossed salad.